Otherwise known as “The Bay” Newquay’s town beaches are a great option for surf lessons when surf at the western facing Fistral beach is big and unsuitable. The town beaches often provide shelter from the wind due to “the bay” facing a slightly different direction from Fistral Beach. 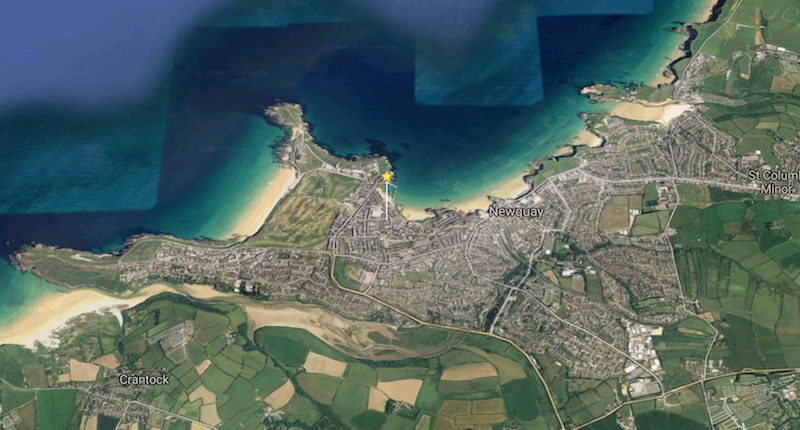 Our central base in Newquay puts us within a short walking distance of the Newquay beaches. 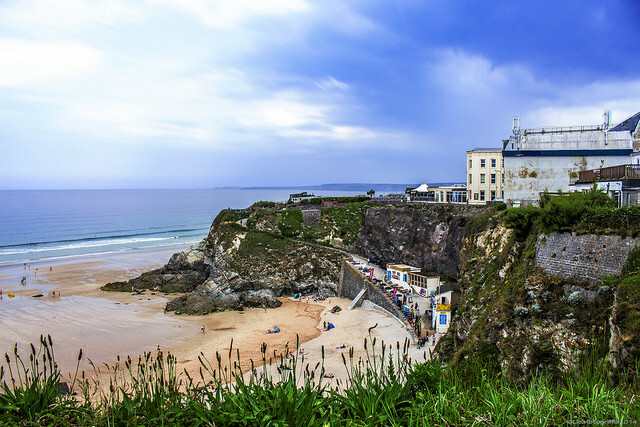 No visit to Newquay is complete without experiencing the thrill of catching a Cornish wave and the Town beaches provide the perfect setting for enjoying a summer day on the sand before relaxing in one of the many bars and restaurants that line the shore. The Newquay Bay comprises of four main beaches with two outlying beaches on the north east fringe of the town. From Towan beach at Newquay harbour to Watergate Bay, each beach shares common attributes as well as possessing their own unique benefits. 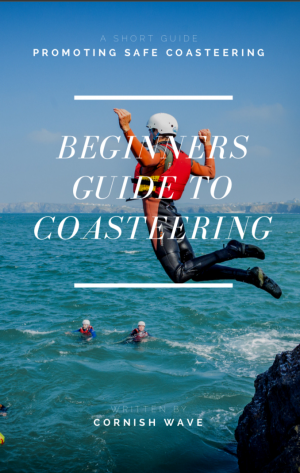 WHY IS THE NEWQUAY BAY GOOD FOR SURFING? Surfers in Newquay ultimately enjoy an increased amount of surfing days due to the shelter the Newquay bay provides. The further north east towards (Great Western, Tolcarne, Lusty Glaze) the more exposed the beaches become reducing the amount of shelter from the expanse of the Atlantic. 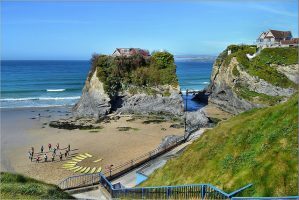 Towan beach and the Newquay bay in general are flat beaches, the natural lea of Towan headland protecting them from the majority of strong currents and winds, helping to keep the sand compact and rip currents to a minimum. This compact sand shapes how the waves approach the beach and how they break, although ‘the bay’ is not always favoured for highly experienced & advanced surfers due to the wave shape – surfing and general water users flock to the beaches for a host of other benefits. Towan meaning “sand dune” in Cornish is located in the centre of Newquay town. Stretching from Newquay harbour to neighbouring Great Western, Newquay’s Towan beach is the saviour for many surfers when large swells and high winds prove too much on the coastlines west facing beaches. Wave quality: 5/10 *Towan beach is especially suitable for beginner surfers. Great for those first times ‘outback’. Type of wave: Sandy beach break. Favoured wind direction: Southerly and easterly winds are preferred. Sheltered from strong westerly, south westerly winds. HOW TO GET TO TOWAN BEACH? The main access to Towan beach is from Beach road. Depending on the stage of the tide you can access Towan beach and neighbouring beaches from the harbour steps or from above from Killacourt. WHEN IS THE BEST TIME TO SURF AT TOWAN BEACH? Ideal conditions for surfing in the Newquay bay are when winds are light to moderate from the south west with a wave height of 2-3ft. Although bigger wave heights will still be suitable for surfing, waves will often start to ‘close out’ when reaching 4 feet and upwards. Towan beach has a local bye law that does not permit surfing at certain stages of the tide. Typically this stage of the tide occurs roughly 2.5 hours after a Spring Tide and 2 hours after a neap tide. We recommend you check the surf forecast, local surf school or Towan beach lifeguards before suiting up and heading down. The best tide to surf at Towan beach is typically when it is mid tide. At this stage of the tide you’ll be able to choose from a mixture of peaks. Although surf’ble at low tide waves will begin to close out frequently. This is a fickle wave located at the far left hand corner of Towan beach and can produce a left hand breaking wave at spring low tides. A prominent spot for local fisherman to line fish so be respectful and aware. Squeezed in between Towan beach and Tolcarne beach- Newquay’s Great Western beach derives its name from the Great Western railway and the Atlantic coast line which in the initial boom of beach tourism between 1876 – 1960 served tourists from all over the UK. Located at the north east end of end of Towan beach, Great Western beach is a relatively small beach at higher tides, and is overlooked by large cliffs. Favoured wind direction: Southerly and easterly winds are preferred. Partly sheltered from strong westerly, south westerly winds. HOW DO I GET TO GREAT WESTERN BEACH? You can walk to Great Western beach from the majority of Newquay within 15 – 20 minutes. Access is gained from Cliff road which leads down a winding path to the beach. WHEN IS THE BEST TIME TO SURF AT GREAT WESTERN BEACH? Avoid surfing here at high tide. Typically 1-2 hours after a high tide is best. Wave can close out frequently around the lower tides. IS THERE LIFEGUARD SERVICE AT GREAT WESTERN BEACH? We advise you check current lifeguard times at the RNLI website. WHAT HAZARDS ARE THERE AT GREAT WESTERN BEACH? Great Western is a flat beach with no real hazards. A small open cave can be explored at lower tides. Great Western beach can be a sun bathers paradise. The small sandy beach at high tide backed by cliffs can become a real sun trap for those wanting a quite to soak up some rays. WHAT SHOPS & AMENITIES ARE AT GREAT WESTERN BEACH? On the beach there is a small seasonal cafe, lifeguard and surf school. 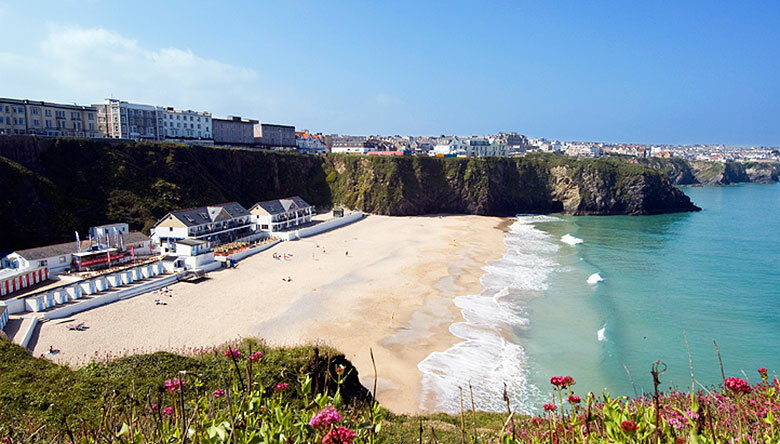 A large selection of the Newquay town is perched above Great Western overlooking the beach. WHERE CAN I PARK NEAR GREAT WESTERN BEACH? Parking around Great Western beach is fairly minimal. The Railway station car park or street parking in the residential area adjacent to Cliff road are good options. Good peaks can be found 1-2 hours after high tide – The paddle back to Towan beach / Harbour is longer than you think. IS GREAT WESTERN BEACH DOG FRIENDLY? 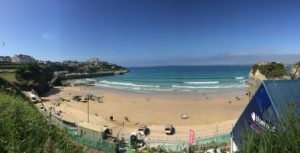 Tolcarne beach sits in the heart of the Newquay Bay and provides a fairly large stretch of sand for surfers, sun bathers and holiday makers. Encompassed by dramatic cliffs Tolcarne beach is slightly more exposed to the open ocean and marks the half way point to where the beaches further along the Newquay bay coastline become more exposed and draw in more swell. Famed for the left hand wedge that breaks off the small headland known as Tolcarne Point at high tides. The Tolcarne wedge is the go to spot for avid bodyboarders. 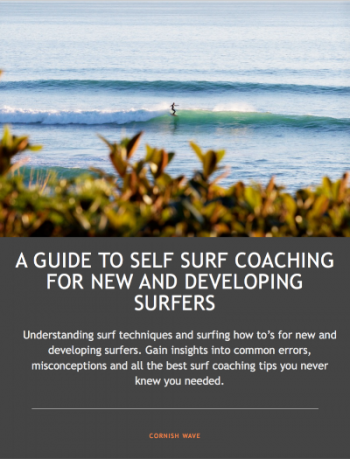 WHEN IS THE BEST TIME TO SURF AT TOLCARNE BEACH? The best time to surf at Tolcarne is 1-2 hours after high tide. Small headlands create the curvature of the beach causing the waves to become disorganised and rebound, no good for stand up surfing during higher tides. High tide is reserved for the local bodyboarding community. Don’t expect many waves if the wedge is working. WHEN IS THERE LIFEGUARD SERVICE AT TOLCARNE BEACH? We advise you check current lifeguard times with the RNLI website. WHAT HAZARDS ARE THERE AT TOLCARNE BEACH? Past the first hour or two of the tide Tolcarne remains a flat beach with compact sand and no real hazards for surfers. HOW DO I GET TO TOLCARNE BEACH? Main access to Tolcarne beach is down a long steep set of stairs on Cliff road. An access road typically reserved for guest staying at holidays accommodation is at the far end of the beach opposite the Hotel Bristol. Pedestrians are welcome to use this. ARE THERE ANY UNIQUE FEATURES AT TOLCARNE BEACH? To reach the golden sands of Tolcarne visitors will need to tackle some 200 steps. A real test after a tough day on the beach. WHAT SHOPS & AMENITIES ARE AT TOLCARNE BEACH? Tolcarne beach is its own eco system with everything that you could want for a day or week at the beach within a stones throw.. A variety of accommodation options, beach side facilities, restaurants and cafe’s, everything is catered for. WHERE CAN I PARK AT TOLCARNE BEACH? Parking is limited. Pay & display car parks and street parking adjacent to Cliff road. 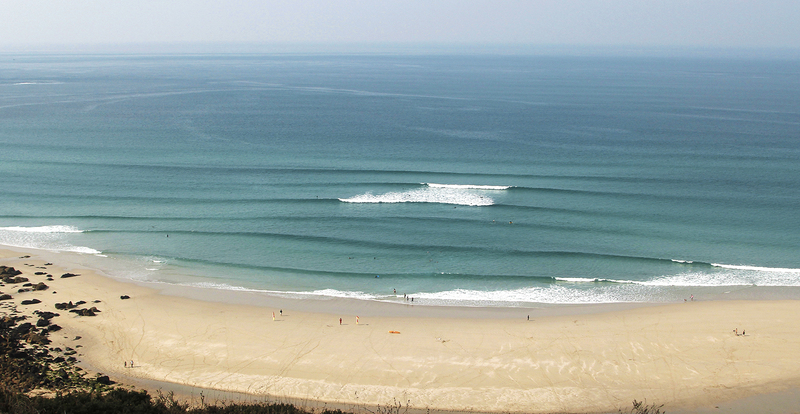 TOP TIPS FROM CORNISH WAVE…. Parking can be limited around Tolcarne even out of season. If you have to drive look for spaces around Edgecumb avenue. IS TOLCARNE BEACH DOG FRIENDLY? No dogs from 1st May to 30th September. The name Lusty Glaze is said to be derived from the Cornish term ‘place to view blue boats’. The beach is formed by the dramatic surrounding cliffs which circle inwards to create a small sandy bay at high tide. Lower tides will see the beach expand making for a stunning back drop and views back to Newquay town or along the coast to Watergate bay. Surfing difficultly: Suited to any level surfer. Wave quality: 5/10 *Can be a great option if conditions are suited. Favoured wind direction: Easterly or southerly. WHEN IS THE BEST TIME TO SURF AT LUSTY GLAZE? Spring low tide is best. A short window to surf can be found on neap low tides if your timing is right. Don’t surf at mid to high tide – waves re bound and wedge past mid tide due to the cliffs. IS THERE LIFEGUARD SERVICE AT LUSTY GLAZE? On the North east end of the beach you’ll find a small cave and several gullies that are cut off from the main beach when the tide rises. An area of beach known as ‘Criggars’ which partially divides Lusty Glaze and Tolcarne Beach is secluded and can produce a decent wave. Spots such as Wine Cove below the north east headland leading to Porth can offer good waves to surf on spring tides. WHAT SHOPS & AMENITIES ARE AT LUSTY GLAZE? 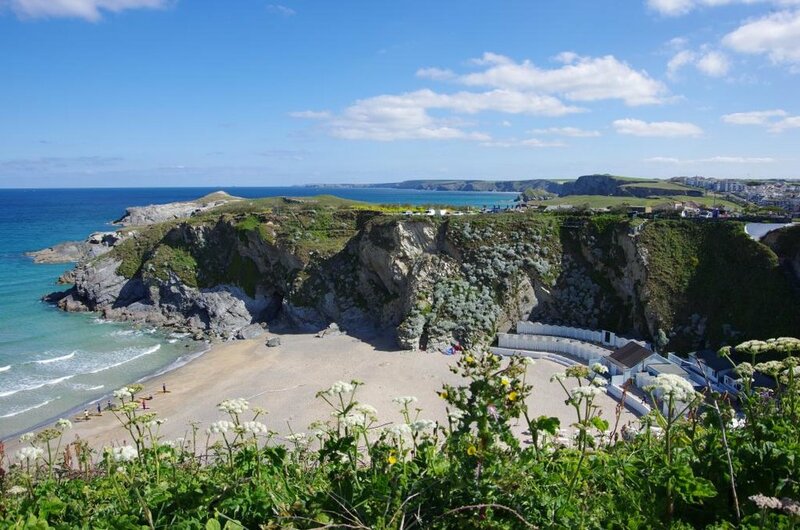 Lusty Glaze offer a mixture of evening events, cliff top activities and beach side restaurants and cafe / bar. WHERE CAN I PARK AT LUSTY GLAZE BEACH? Parking for Lusty Glaze can be tricky. Preferably use street parking on Manewas way, the car park above Lusty Glaze or further down Lusty Glaze road. If the tides and conditions are right Lusty Glaze beach is a great place to enjoy a relaxing late afternoon surf whilst watching the sunset. IS LUSTY GLAZE DOG FRIENDLY?